My name is Noah Rubin, and I am running for Student Government Board, for the position of Board Member for the 2018-2019 academic year. I am running because, in the less than two full years that I have been a student here, I’ve achieved more than I thought possible, and I have Pitt to thank. I have forged connections with both students and faculty, connections so strong that they will persist long after my time at Pitt. I have been introduced to a culture that values everyone, accepts everyone, and learns from everyone. I have had the ability to learn from professors who encourage cooperation and want me to actually learn. I have committed myself to a University that has committed itself to me and my success. Pitt has given me more than I can ever repay, and through Student Government Board, I aim to try. I am from Bala Cynwyd, PA, right outside of Philadelphia (yes, actually right outside!) and I have always wanted to come to Pitt. During my senior year of high school, when I found out I was accepted to Pitt, ecstatic didn’t begin to describe my excitement. My mother went to Pitt, and I grew up hearing about the amazing student experience she was able to have as an undergraduate. I want to help create the environment where my peers will be able to vividly describe, years after they graduate, the amazing undergraduate experience they had; that is why I am running for Student Government Board. Since coming to Pitt, I made a promise to myself; I wanted to be involved on this campus. I so clearly remembered my Convocation. Seeing the students who recorded videos for the incoming freshman class, as they spoke to my fellow wide-eyed peers about the importance of getting involved, and of getting involved early, I immediately yearned to be like them. They spoke with the hard-won wisdom of students who not only excelled in their classes, but who went out of their way to make Pitt better, to benefit more than just themselves; the distinct mark of a student leader. These students, some of whom I would meet in my journey through my undergraduate career, were the people I wanted to be, for myself, but also for others; that is why I am running for Student Government Board. When I first got into my groove after Orientation Week, after being overwhelmed by the more-than-600 organizations Pitt has to offer, a small smattering of which I met at the Activities Fair, I began my search to get involved. In the Fall of 2016, I took a leadership position in my Residence Hall as part of the Resident Student Association, and became close with my Resident Assistant, to gain a perspective of the inner workings of the people who work directly for students. In the Spring of 2017, I got involved with Student Government Board, joining an ad-hoc committee made up of fellow first-years, aptly called the First Year Council. Through this process, I was able to work directly with the Board Members on their initiatives, cementing a deep-rooted appreciation for validity through deliberation. I also rushed a fraternity, Alpha Epsilon Pi, where friends became brothers, and I truly learned the difference between the two, and became a First Year Mentor, where I was able to work to make the first semester of college the best possible for incoming freshmen students. It was through this latter activity that, but one year after my own Convocation, I was able to fulfill the first thing on my Pitt bucket list; be on the television screen at Convocation. I wanted this for myself, and I worked to make it happen. And I want every Panther to know they can, and should, do the same; that is why I am running for Student Government Board. As a sophomore, I continued my involvement. 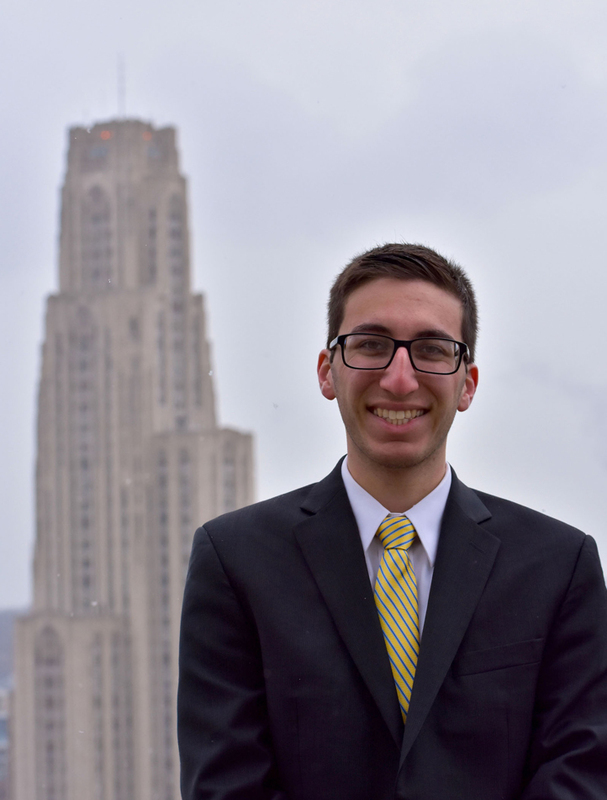 In the Fall of 2017, I took a leadership role on behalf of all Residents of Pitt’s Residence Halls by joining the Executive Board of the Resident Student Association. I got to work with people that reminded me of me, merely one year prior. I took a leadership position in my fraternity that required me to communicate with other members of the Greek community, in order to fulfill our mutual goal of service to our philanthropic organizations. I continued as a First Year Mentor, working to make sure the new freshman class had all the resources they needed to make their first year on campus, and beyond, as amazing as the first year I had. I was beyond fortunate to have the tools I needed to succeed available to me, and I felt it was my obligation to make sure my personal story was not the exception, but rather the norm. But I knew the work didn’t stop there; that is why I am running for Student Government Board. This semester, I am grateful for the opportunity to run. I have had my heart set on this since before my undergraduate career began, and now I get to eagerly exhibit my energy for Pitt once more. The initiatives I intend to pursue are increased safety measures for all Pitt students, stronger opportunities for quality campus experiences, and a perspective shift from local to global; in short, to effectuate real, positive change, tangible to all. I promise to serve Pitt, just like I’ve been doing since my start here, and what I will be doing until I graduate; that is why I am running for Student Government Board. Hail to Pitt!